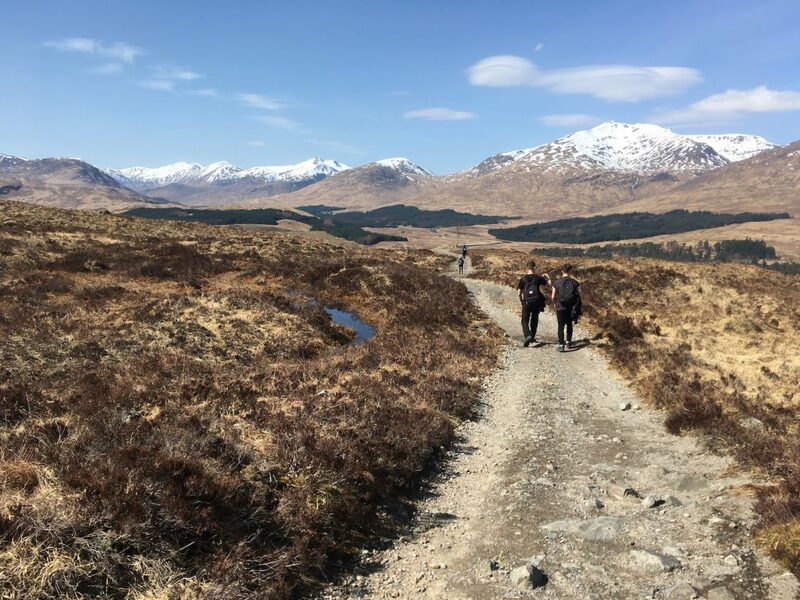 11TH APRIL – DAY 4 – INVERARNAN TO TYNDRUM After the challenge of upper Loch Lomndside, this section of The West Highland Way offers a welcome reprieve with twelve miles to cover to return to the accommodation in Tyndrum on good paths and tracks. 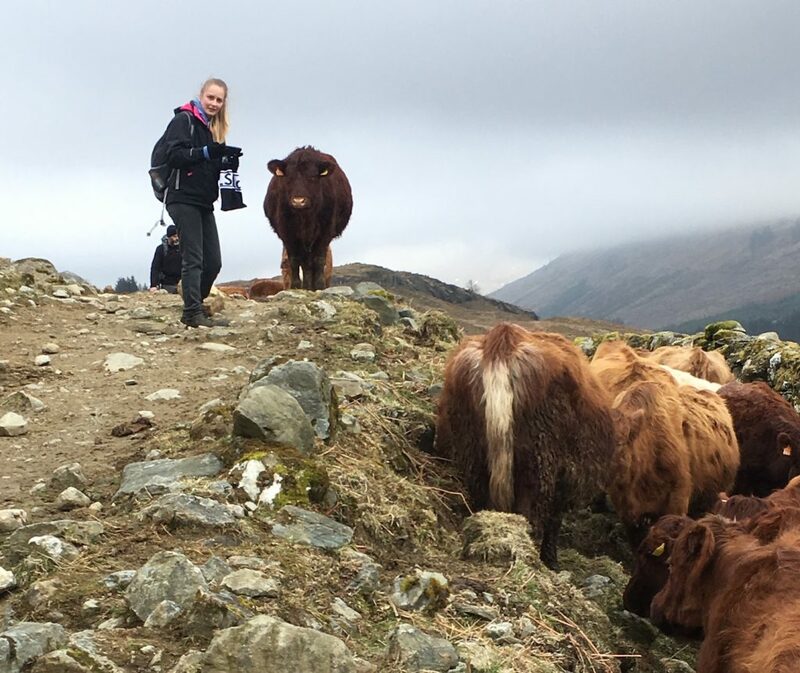 We started walking at 0930 from Beinn Ghlas Farm with the local herd of wild goats grazing nearby. It was another overcast but dry day with a cooling, fresh easterly breeze. The wind in particular made the day feel pretty chilly and by the end of the walk I’d increased my layers to something akin to what I might wear in winter. Niall, true to form, did most of the day in a t-shirt! We made steady progress up Glen Falloch, with the Falls of Falloch looking good off to our left. It was busy on the trail with a lot of groups doing the way and as we made our way up the Glen we came across a steady stream of people walking. We passed under the main road, then around Keilator Farm we had to negotiate a big herd of cattle that were covering the track. They were docile beasts and John and Steph took the opportunity to get some photos with them. Shortly after we arrived at the junction where a track leads down into Crianlarich and found a spot to have lunch. With the wind still blowing through, temperatures dropped quickly, so we didn’t have as long a break as on previous days before we carried on up and through the woods. This was a rough section with a fair few undulations but after crossing the A82 things became level once more as we wandered along a track through the fields at Kirkton Farm. We made our way round the outside of the farmland to the wigwams and farm shop at Auchtertyre, where we stopped for a break and got a few things from the shop. This was a pleasant place to take some time and provided a welcome boost for the final short walk up the way to Tyndrum. With a constant cap of cloud on the hills we didn’t get the usual stunning views west to Ben Lui but passing the site of Battle of Dalrigh, then on through some regenerating native woodland and into the area of the old lead mining works on the edge of Tyndrum, there are always things to see. We made it into Tyndrum at 1615, now with more than half of the way complete! 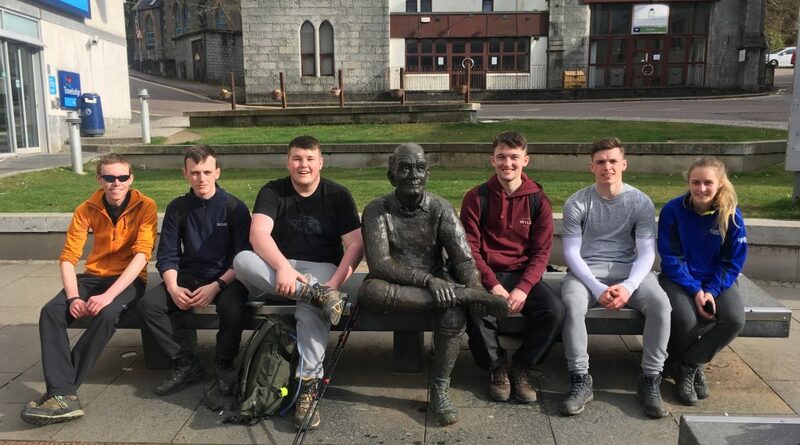 12TH APRIL – DAY 5 – TYNDRUM TO GLEN COE SKI CENTRE The week’s longest day by far at nineteen miles, this was one that our team had been anticipating from the start. They were ready for the challenge and we set off at 0900 from the Green Welly Stop in Tyndrum under leaden skies with a chilly breeze blowing through from the east, similar to the weather we’d been having all week. It was a steady climb north out of Tyndrum but soon we were walking by the West Highland Railway line and Beinn Dorain was trying to make an appearance up ahead. After passing through the cattle creep under the railway and walking towards Auch Farm we started to pick-up some sunshine and the views of the hills around us started to open up. We had made good time and everyone was very pleased that we’d covered four miles already! After Auch the weather cleared entirely and I went from wearing four layers to just my t-shirt in the space of about fifteen minutes. We were sheltered from any breeze, the sun had definite warmth to it and all of a sudden there was barely a cloud in the sky. People’s feet were starting to get tired though and so we made a welcome pit stop at the Bridge of Orchy Hotel for a drink and a sit down. I also used the opportunity to apply some sun cream, the weather was that good. Rejuvenated by the rest, we climbed over the hill to Inveroran in just over an hour. This section was a real highlight of the whole trip with amazing views of the surrounding landscape. Especially from the high point on the path, which was a perfect vantage point over Loch Tulla to the hills of the Black Mount and then all the way out west to Ben Starav, still capped by an impressive amount of snow. Down at Inveroran it was perfect conditions to enjoy our lunch sitting in the sun by the pub with a deer grazing quietly in the nearby trees. We even had one of the estate’s young cocker spaniels to provide a bit of entertainment. Leaving Inveroran, a niggling foot injury that had been bothering Alex for a few days caught up with him and he decided to call it a day at Forest Lodge. After arranging a pick-up with Ollie, we carried on, heading up the old Thomas Telford military road onto Rannoch Moor. The road ascends steadily, with a good cobbled surface, sheltered on it’s east side by pine plantations. On the day, this was hot work. By the time we emerged from the shelter of the trees, the cloud had started to build again and the hills we beginning to disappear into the cloud once more. Although some of the clouds looked a little threatening, it stayed dry as we made our way out onto the moor and across to the remote Ba Bridge. This is a very wild section of the trail and the views out over the vast peatland to the distant hills in the east were as impressive as ever. Arriving at Ba Bridge we had another rest and admired the river, swollen by snowmelt, powering through under the bridge and through it’s little gorge. By this point it had got a little bit chilly so we layered up, had a snack and headed on. Niall had been finding the section over moor tough going to this point. However, as we climbed away from the bridge we stopped to take some pictures with the snow-covered peaks of the Black Mount in the background. We pulled some daft poses, Niall had a swig of his Irn Bru and someone played ACDC on their phone. This combination served as a total game changer and shortly after we were powering over the last rise in the road. We came round the final corner and Glen Coe burst into a view. Despite the cap of cloud on the tops, this is always a special point of the trail. We made a strong finish into the ski centre car park at 1830, with a great feeling of satisfaction that we’d made it to through the way’s longest stage! 13TH APRIL – DAY 6 – GLEN COE SKI CENTRE TO KINLOCHLEVEN This was the shortest day of the trip with only 10 miles to cover, picking up from where we left off the day before at Glen Coe Ski Centre and heading over the Devil’s Staircase to end back at our accommodation in Kinlochleven. On paper the day looked ominous. The Devil’s Staircase on Friday the 13th! The forecast also had the highest likelihood of rain of the entire week. However, superstition aside, the day went well and we had a lot of fun along the way. Setting off from the ski centre around 0930 in a light drizzle we made our way down to the Kingshouse where it was interesting to see how the ongoing redevelopment was taking shape. We crossed the old bridge and made our way along by the A82, to Altnafeadh. At Altnafeadh a heavier shower of rain passed through, but it was short lived and as we climbed away from the busy main road things were brightening up. It was a steep climb up the staircase, but everyone coped well, despite some tired legs at this late stage on the trip. We entered the cloud just before the summit but as we sat by the cairn marking the high point eating our lunch we got to enjoy some atmospheric views as the cloud swept off the nearby Beinn a’ Chrulaiste. As we started our descent three large patches of snow still covered the The West Highland Way trail. The upper layers of these patches had been softened by the temperatures, which were a little above freezing, but they had a solid base so we were able to walk across fairly easily and everyone enjoyed the opportunity to get onto some snow. 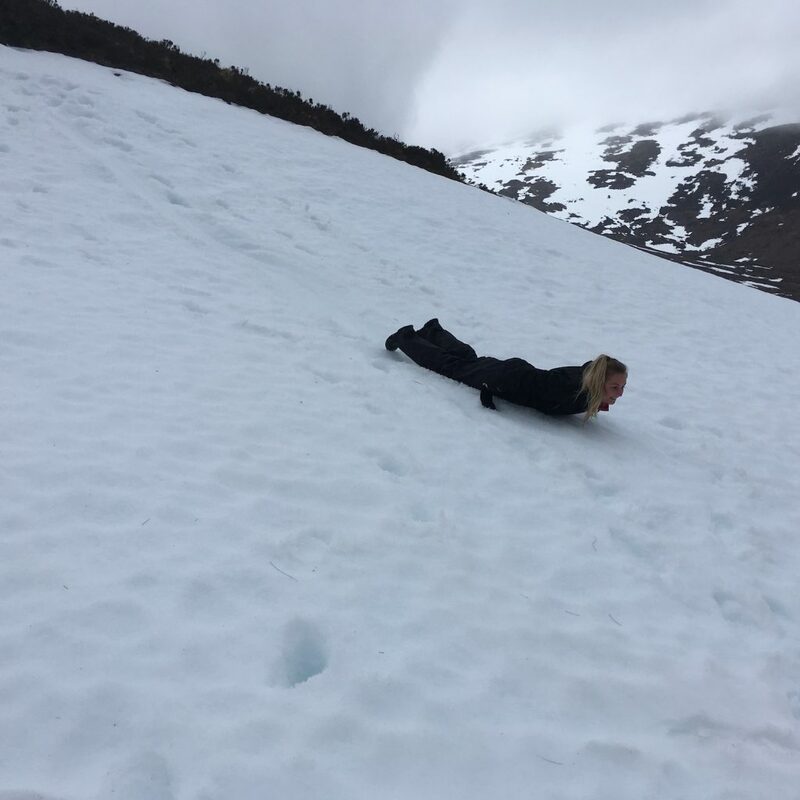 The final patch was steep enough to slide so, with heather at the bottom, we took ten minutes to enjoy some bum sliding down the slope. This was a great laugh, but eventually we had to drag ourselves away, the final descent into Kinlochleven pressing on our minds. It was a steady descent, where we saw plenty of frogs, frog spawn and then got a fly past from three RAF Typhoons. The path eventually gave way to a larger track and we dropped steeply though the trees and into the back of the village. We were back at our accommodation shortly after 4pm, again with tired feet, but happy in the knowledge that there was plenty of time for recovery before our walks final stage tomorrow. 14TH APRIL – DAY 7 – KINLOCHLEVEN TO FORT WILLIAM The last day of the trip was here and despite lingering aches and pains, everyone was up, packed and ready to go for a slightly earlier start at 0830. It was another calm, but chilly and overcast morning. However, as we climbed steadily out of Kinlochleven the cloud started to break up with warm sunshine breaking through. As the weather cleared we got some stunning views south to the famous pinnacled ridge of the Aonach Eagach Ridge in Glen Coe and ahead to the peaks of the Mamores. After the initial steepness of the path, we joined a more substantial track that takes a more gradual ascending line into the pass of the Lairigmor. We tool a quick stop to apply some sun cream and then headed up into the pass along with many others undertaking their final day on the way. Gradually things clouded over again and by the time we reached the head of the Lairigmor there was a definite chill in the air once again. We descended to the ruins of the settlement of Lairigmor itself and took our first proper break of the day. The team were beginning to feel the effects of the week’s walking by this point but everyone rallied round and we made good progress round to the road at Lundavra for lunch. The longer lunch break gave everyone a welcome boost and we moved on again in high spirits with the end of the way feeling within touching distance. There has been quite a lot of clearance of the trees along this section of the trail, giving much more open views than previously and as we rounded the corner towards Glen Nevis, the sun reappeared just in time for Ben Nevis to come into view. There was still plenty of snow on the upper part of the hill and as we got closer the peak looked every bit of it’s 1300m as it towered over the surrounding landscape. We also saw a stoat dashing in and out of a dry stone dyke during this section, which was an exciting addition to the list of wildlife we’d seen during the week. After some undulations in the path we joined the forestry tracks above Glen Nevis and started the gradual descent towards Fort William. It was pleasant wandering down through the pine trees with occasional views across to Ben Nevis. The outskirts of Fort William appeared in the distance and eventually the northern side of the Mamores came into view. When we reached the road in the glen we had the full glare of the sun on our back and had to stop one last time to add a further layer of sun cream. Everyone was totally focused on completing the route now and we kept a steady pace in towards the town. As forest gave way to buildings, the pace lifted with anticipation of the finish line getting close and we made a strong finish along the high street where a passing couple obligingly took the successful team photo. After settling into our accommodation all that was left was to head back into town to enjoy a well-earned pint! Lots of smiles at the end of the The West Highland Way after a successful Week!